From time to time, I decide I am going to treat myself, and visit the always entertaining Vintage New York. This is a special place, and I always am very excited at a prospective trip here to this unique wine shop mecca. I recently went about a week or so ago, and tasted six wines...and bought half case of wine. First to report on was my mezmerizing experience with Channing Daughters 2004 Pinot Envy. This unique blend is 77% Pinot Noir and 23% Merlot. It's a unique blend. The Pinot adds the cherry and pepper, and the Merlot gives it enough classical structure to rate something higher than a traditional pinot. It's a fabulous marriage, medium body and wonderful mouthfeel. A very lovely wine. Great for luxurius sipping, or a great compliment to any number of dishes. This is a lovely wine to serve to friends. 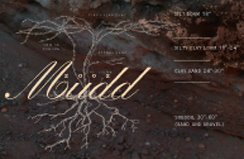 Next on the list was the Channing Daughters 2003 Mudd, named after legendary vineyard manager Steve Mudd. It's a blend of 86% Cabernet Sauvignon, 12% Merlot, and 2% Blaufrankisch. It was grown in dirt in which the first 18" were silt loam, siltly clay for the next 18-24", and between 24" and 30" was a clay mixture. This medium bodied red was a dark, deep ruby-blood red, with fabulous cherries, plums, vanilla, and pepper all coming through. This was a lovely wine. A fabulous enterting wine for big meal such as roasted meats or heavy French or Italian dishes. This is a great new red heavyweight out on the Long Island scene. Mr. Mudd should be very proud to have his name on this bottle. A nice homage to an intrepid eastcoast pioneer. As always, when I think of dessert, Pindar is a name that invariably comes to mind. This time I tried their 2001 Cabernet Sauvignon Port. This big, chewy new port is like mouthful of raisins and vanilla. Touches of oak and plum round out this wonderful new port, which instantly becomes one of the better ports on the whole eastcoast! A great accomplishment by the folks at Pindar. And the nice thing is, it's relatively young. Buy an extra bottle or two and lay it down for three or four years...it will only get better! And a solid bargain to boot. In the April 5, 2006 edition of New York magazine, Rima Suqi, in the "Best Bets" column, raved about Paumanok's 2005 Riesling. The header ran, "Riesling For Right Now," and in it she lauded the "delicious 2005 Dry Riesling." She wrote that it was not only filled "with floral amoras but a lively acidity." According to Ms. Suqi, the wine is already being served at Cafe Gray and can be purchased at McAdam Buy-Rite at 398 Third Avenue (near 28th Street). Better race there. Because I already bought two bottles, and the rest are going to go fast! This comes fast on the heels of Howard G. Goldberg's raves in the New York Times on January 29th of this year, writing, "Not surprisingly, the ambitious 2002 Assemblage ($36), a svelte blend of 53 percent merlot and 47 percent cabernet sauvignon, was my favorite. Showing layers of berry and other fruit flavors, it had obvious balance. Tasted blind, this wine may come across as a Bordeaux." Mr. Goldberg had raved the week before that as well, lauding Paumanok's whites! "Mr. Massoud's technical skills show up in Paumanok's 2004 sauvignon blanc ($19.99), 2005 semidry riesling ($19.99), 2003 barrel-fermented chardonnay ($17.99) and 2004 Grand Vintage chardonnay ($30). This is a tempting array of whites, from Aquebogue, on the North Fork," wrote Mr. Goldberg. The dry sauvignon was, according to Howard, "Light, lean, citric, appetite-awakening and exceptionally long on the palate, this zesty wine, as Mr. Massoud observes, more nearly resembles a Sancerre than a New Zealand sauvignon. Stay with it, and you detect a scrim of tropical fruit in the background." Congrats, yet again, to the folks at Paumanok! In the February 15, 2006 edition of The News Journal, wine writer Roger Morris reported on The Business Monthly’s report on American wine making. Mr. Morris wrote, “In the world of American wine, there's the West Coast, and there's Everyone Else. But everyone Else -- the regional wineries of the East Coast, South, Southwest and the Plains -- keeps growing and prospering and might even be threatening Western dominance. “A review by the industry magazine Wine Business Monthly says that there are more than 5,300 wineries in the United States today, and a little more than half of those -- 2,740 -- are in California. Washington comes next with 418, and then Oregon with 317. “Rounding out the Top 5 are East Coast wineries -- New York, once the center of American winemaking, with 252, and neighboring Pennsylvania, No. 5 with 130. “The rest of the Top 10 are, in order, Texas, Virginia, Ohio, Michigan and -- I'm surprised -- Colorado. New Jersey is No. 14 (52 wineries), Maryland is No. 21 (32), and Delaware, the First State, is last when it comes to wineries with only one -- Nassau Valley Vineyards near Lewes. Even the urban District of Columbia has three wineries, perhaps one for each branch of government. “Within the last four years, the local Brandywine Valley wine scene has grown from being essentially a very good one-act business -- Chaddsford -- into multiple wineries concentrating on a variety of wines. “And the Brandywine region continues to grow as local vineyard owners ponder becoming winemakers. It may not be California, but being No. 5 is still not so bad. 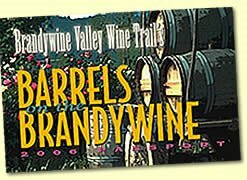 I'm a little late telling you about barrels on the brandywine, but you should spend a little time exploring more about Pennsylvania wines. I'm telling you, they are coming on! Roger Morris has written about wines for years and regularly visits the winegrowing areas of the world. Write to him at The News Journal, Box 15505, Wilmington, DE 19850; fax 324-2415; or e-mail features@delawareonline.com. Pennsylvania winemaking has come a long way. In the past, Pennsylvania had long been led by names like Chaddsford, French Creek, and Blue Mountain among many. But the entire state of Pennsylvania it seems is giving other local states a solid run for their money. Good news for wine drinkers, and especially for Pennsylvania. From January 7 to 14 of 2006, in Harrisburg, Pennsylvania, 16 wineries competed in the Annual PA Farm, at the Farm Show Complex in Harrisburg. They were on the main floor near the Culinary Connection. Pinnacle led the pack with four winners, including best in show and best dessert wine for their ice wine, as well as golds for their Chardonnay and Chambourcin. Vynecrest won for Best of Show Fruit Wine and for their Riesling. Pinnacle Ridge had mad a respectable showing last year at the Finger Lakes Wine Festival and brought home multiple gold from the Pennsylvania Wine Competition. According to the winery, “frozen Vidal Blanc grapes were harvested on December 21st and pressed over a two day period to yield this exceptional desert wine.” As stated, I found exotic aromas of honey and definitely tropical fruits. I found a rich sweetness and an excellent acidity to balance it out. With 20% residual sugar, this is indeed rich dessert wine well worth the victor’s laurel’s and your hard earned cash. Ambrosia! Their Cuvee Chardonnay and Chambourcin were also very intriguing and memorable. Vynecrest won for their Cherry DiVine and their Riesling. These were both fine wines. The Cherry DiVine was a favorite last year, and is already sold out. Vynecrest also medalled at the San Francisco International Wine Show last year. “Will Success Spoil Willy Frank?” asked Wine Business writer Mort Hochstein in November, 2004. “After a quarter of a century of struggling to earn recognition and financial stability for the winery started by his father, Willy has finally pushed that Sisyphean rock to the top of the hill…No, success will not spoil Willy Frank. Neither prosperity nor advancing age can slow him down.” Would that it were so. "Everyone who knew him expected him to go forever," Frederick Frank, his son, told the press. Pioneer Finger Lakes winemaker Willibald Konstantin "Willy" Frank died of a stroke Tuesday, March 7, 2006. He was 80. News of his passing immediately spread around the world. “Dr. Konstantin Frank, a World War II refugee from Ukraine, had hauled the Finger Lakes into the modern era by successfully cultivating vinifera grapes in a region where winter temperatures commonly drop to 15 below zero. As a business, however, his winery was failing,” reported the Associated Press. An old proverb states, “Every father should remember that one day his son will follow his example instead of his advice.” Willy Frank followed his father’s example. Willy Frank was a pioneer in his own way. 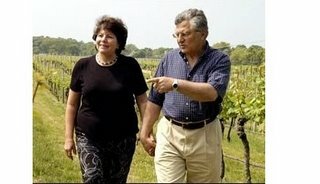 While his father, Konstantin, pulled the Finger Lakes Region into the 20th century, when he bred hardy vinifera rootstock that eventually became much of the basis of the now exploding eastern wine country, it was Willy who made excellent wines from those grapes, and helped grow New York state wines, especially Finger Lake wines, into a multi-million dollar industry. “Willy's death last week removed an energy force from Keuka Lake, and from us,” wrote Thomas Pellechia in the Elmira Star Gazette. I had the honor of meeting Willy once, and spoke with him several times by phone about his wineries and wines. He was a passionate wine lover, and a consummate promoter. His passion was infectious. He was friendly, gracious, and a terrific salesman. He was also a pioneer, like his father. His passing is a huge loss for the industry, for he was a link, as Wellington Mara, owner of the New York Giants, was to the NFL and his industry’s past. There are many new wineries popping up each and everyday in New York State. And each and everyone of that next generation of winery owners owes a huge debt of gratitude to Willy Frank. As a writer who covers the region and an aspiring winery owner, I know I do. In a sense, for those of us who follow, support, and are involved in east coast wine, we are all his sons. We should all aspire to follow his example. I was walking through the offices of my new job the other day, when I happened upon a great new book...Kevin Zraly's American Wine Guide. This is a small pocket guide packed with information. 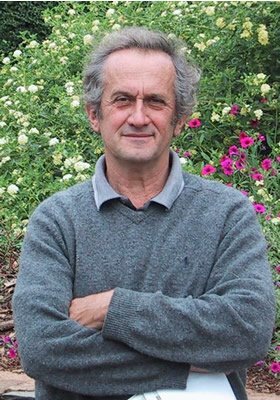 Zraly, and his Sterling Publishing editor Steve Magnuson, have done something incredibly brilliant - they have finally given small independent wineries their due. Obviously, a large portion of the book is dedicated to California and the northwest, as it should be. But, the book is also chock-a-block with color labels from every state in the union, including Maine, New Hampshire, Vermont, Massachusentts, Rhode Island, Connecticut, Pennsylvania, Maryland, Delaware, New Jersey, Virginia, West Virginia, and New York. In it he extols the most well know wineries in each state, and where the state ranks in terms of wine production, etc. While other pocket guides pretend to cover the smaller, independent wineries, in fact the do little. Here, for the first time, some one of Mr. Zraly's stature, has put together a colelction, if not complete, at least the highlights from every state. Virginia and New York especially get good coverage. It is a good start. Thank you Mr. Zraly! Absolutely the best American pocket wine guide in the US today. Congrats! Zraly say that these are the "Wineries to look for in Neww York State:"
Kevin wrote of New York State..."The most significant developments are taking place on Long Island, which has experienced the fastest growth of new vineyards...the predominant use of Vitis vinifera varieties allows Long Isalnd wineries to compete more effectively in the world market. He also remarked on the Hudson Valley, writing, "The Millbrook Winery in the Hudson Valley has shown that this region can produce world class wines - not only white, but red too, from such grapes as Pinot NOir and Cabernet Franc." It was a beautiful day last Wednesday in New York City. The first warm breezes of spring were winding their way through the cool city streets. Suddenly, over-coats were shed. T-shirts were shown off. Many people had a bright spark in their step as they passed through New York's many canyon-like blocks dappled with the intoxicating spring sun, and topped with hints of bright blue sky. Being in lower, mid-town, I decided to walk down to Union Square. I was going for a nice walk when I suddenly realized the Farmer's Market was in full swing. And a flood of memories came rushing back at me, washing over me like the spring breezes themselves. In my so called 'salad days', I used to come down to the Union Square Farmer's Market, entranced with the wholesome baked goods, fresh vegatables, and wines from New York State. That was when I first fell in love with east coast wines. I remember tasting Fox Run and Hunt Country back when I was an assistant at Macmillan Publishing Company (back when it was still a going concern - before Robert Maxwell's evil hand felled the proud house), and I used to bring home, in the late 1980s and early 1990s bottles of their table reds and whites. The wines were inexpensive and fun, and fit within my budget and sense of supporting the budding New York wine business. Thus, with this sense of romanticism, I approached the current fair at Uinon Square. There were many fine baked goods, as I had remembered, artisnal cheeses, jams, and heirloom vegetables and fruits. And low and behold there was a winery! 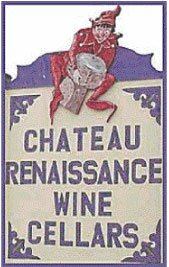 Chateau Renaissance. I approached the stand with rose colored glasses, admittedly. I was in a daring mood and tasted some of their fruit wines, in an attempt to harness my spring optimism. Low and behold, one grabbed me. I bought several small bottles of Peach wine. The tasting notes say it brings visions of summer, and boy were they right. The bowl was filled with the smell of fresh, ripe peaches. And the taste was light and well balanced, sweet but with just enough acidity to make it mouthwatering. A pleasant surpirse...a little promise of summer in a glass. I highly recommend this little bottle of wine as a great after dinner or sipping wine. Sweet, but light and fun, it is a summer treat, just waiting to help you break the winter doldrums. Have fun, and think of blue skies. 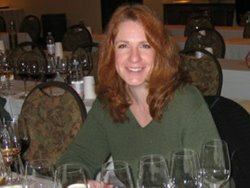 I was at WINERIES UNLIMITED 2006, in Lancaster, PA, and I attended an excellent seminar entitled, "Developing a Professional Palate" which was led by Amy Mumma, from Central Washington University. The seminar notes read, "In this tasting seminar we will objectively analyze each wine for components, such as acidity, sugar levels, alcohol, body, tannins, structure, character and winemaking techniques that influence the style of the wine. We will also examine how to assess quality levels, maturity and potential of a wine to age." I was skeptical. I'd been to dozens of tastings with "experts" always giving you this pointer or that. I am a wine writer. Matt Kramer, Howard Goldberg, Robert Parker, those are wine experts. But I was thinking it might be a waste of time. In June 2005, Jancis Robinson wrote, "Her charisma, her ease with public speaking, her desire to share her passion and her extensive knowledge of wine have led her to become a candidate for the Master of Wine." Well, she made it. Amy has been named the world's top female wine professional after winning the Wine Women Awards competition. Mumma was among 167 nominees from 20 different countries. Ten finalists were invited to attend the finals in Paris in June, to show off their technical knowledge, tasting, and presentation skills. Mumma holds the Advanced Certificate in Wine and Spirits from the Wine and Spirit Education Trust in the United Kingdom and a Diploma of Tasting from the Université de Bourgogne in Dijon, France, and has visited many of the world's wine-producing regions. I want to say I have to apologize. I was wrong. Ms. Mumma was funny, insightful, sharp, and an excellent wine taster. I was much impressed, as was the rest of the crowd. I learned all kinds of new things. I thought she did an excellent job making important information and complex tasting experiences easier to turn into words. My hat's off to Ms. Mumma! We tasted one red and one white. And I really enjoyed the red. It was a young wine, clear ruby red. It had a bright cherry nose and nice body, and long finish - your mouth kept watering, long after the wine had been swallowed. Boy, was it tasty. It turned out it was a Gabriel Rausse Cabernet Franc 2004. I thoroughly enjoyed it and I recommend getting a bottle or two or many and treating yourself. It's a wonderful wine experience. And don't be greedy, share it with someone you love...or better yet, share it with someone who likes wine. And as for Ms. Mumma, thanks for the pointers! And if any of you are lucky enough to meet her, say hello to her for me. Writing in the New York Times on March 5th, Howard G. Goldberg wrote, " THERE is good and bad news from Channing Daughters Winery. The good news is that its 2005 sauvignon blanc is one of the finest Long Island has produced in a decade and there is an ample supply — for now. The bad news is that its 2004 Meditazione, a mind-bogglingly complex seven-grape white blend, is sold out. 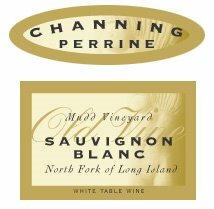 "The sauvignon blanc grapes in the Channing Perrine sauvignon ($18) came from vines planted at Mudd Vineyard, in Southold, in 1975; they are among the Island's oldest. (Perrine is Larry Perrine, the president and chief executive of the winery, in Bridgehampton.)" "The sauvignon is a whirligig of tropical-fruit aromas and flavors, notably grapefruit, and of coconut notes and herbs... Sip after sip, the bright acidity zings the palate, cleansing it for the next appetite-sharpening round, while the soft texture caresses the palate." Howard also said the Meditazione ($40) "helps define Long Island's high-stakes wines, took its cue from Italians' vino da meditazione — mediation wine, intended to appeal to the intellect and digestive system." According to Mr. Goldberg, the winery only made 29 cases which were "immediately allocated to Channing Daughters'wine club and a few choosy New York restaurants, among them Bouley, Danube and Hearth. The 2006 vintage will yield 60 cases if nature cooperates." Lucky dogs. Congratulations to Channing Daughters, and congrats to those lucky fe who get to try these lovely wines out! see Howard G. Goldberg's columns in the New York Times. 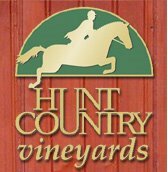 Hunt Country Vineyards' Ice Wine was featured on NBC's Today Show in January! Congratulations to Arthur and Joyce Hunt! I've gushed about this wine before, so you'll have to pardon me. Their Ice Wine is consitently one of the best ice wines made in the United States. It's liquid gold. The golden, sweet honey colored wine is well balanced, with just the right amount of acidity. It's excellent. A spectacular new vintage of the luscious Vidal Blanc Ice Wine will be released in April or early May. Email or call them (800.946.3289) now to reserve your bottles! When I was writing my book I had considered covering the Carolinas, but both my wife and my editor both said I had to cut it off somewhere. It was unfortunate because I had heard that the Biltmore Estate Winery was a treaure trove of fine wine on the east coast. Recently, I went down to Ashville, North Carolina to visit the fine folks at Lark Books. I had fifteen minutes and ran to a local liquor store and bought some Biltmore wines. I was on a business trip, so I just didn't have the time to visit the winery. "At the Biltmore Estate Winery, rich tradition meets state-of-the-art technology under the masterful direction of our French winemaker Bernard Delille. Vineyards on the estate's west side grow several varieties of vinifera grapes while the estate's former dairy complex now houses the winery. It produces 75,000 cases of wine each year in about 15 varieties. 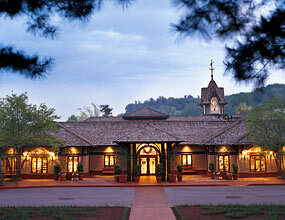 Biltmore wines have been awarded gold and double-gold medals in prestigious national and international competitions." I got off the plane, drove home, and couldn't wait to pop the cork on a bottle or two. Dominique and I opened up a bottle of 2003 Biltmore Estate Cabernet Sauvignon. Dominique made grilled pork chops, yellow rice, and black beans with diced kilbasa, diced apples, and onions. And then we opened up that bad boy of cabernet. Biltmore's red had beautiful color and great legs. The color was a dark ruby red. And the nose was wonderful. Blackberry and cherry. And the taste was incredible. Nice fruit up front and a nice dry finnish. A lovely wine. I was sorry I did not get to visit the winery or get to taste more of their wines. Sorry too because we drank the whole bottle and we won't a chance to drink it again for a while since I won't be going down there any time soon. But if you're in the area, or you get a chance, find some Biltmore Cabernet and drink away. It's an excellent wine...one of the most solid red wines on the eastcoast! And enjoy!!!! And my apologies to the folks of the Carolinas....mea culpa. We'll get you on the reprint.